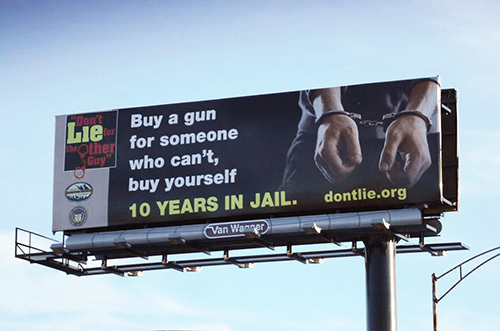 A Don't Lie billboard warns residents of the penalities of buying a gun for someone who can't. 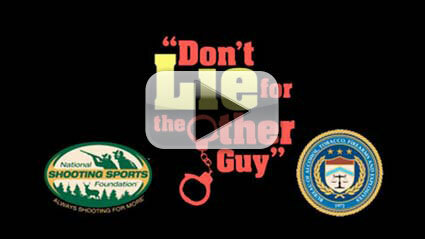 The National Shooting Sports Foundation (NSSF), the trade association for the firearms industry, in coordination with the Bureau of Alcohol, Tobacco, Firearms and Explosives (ATFE), the Department of Justice (DOJ) and Office of Justice Programs (OJP) launched Don't Lie for the Other Guy, a national campaign to prevent and discourage illegal "straw man" purchases of firearms, in July 2000. Since then, firearms retailers throughout the United States have learned how to better identify potential straw purchasers. At the same time, the public in cities across the country has learned the very severe consequences of illegally purchasing a firearm for someone who cannot legally possess one or who does not want to have his or her name associated with the transaction. Buy a gun for someone who can't and buy yourself 10 years in jail.